AVAILABLE FOR THE FIRST TIME AS A RENTAL. RARELY IS A HOME OF THIS QUALITY AVAILABLE TO RENT. Enjoy unmatched ocean views from the edge of Maine's rocky coastline in Broad Cove. This beautifully renovated, in 2017/18, stunning oceanfront home in Cape Elizabeth, Maine, offers 4 bedrooms, 4 baths and commanding ocean views from nearly every room in the house. This quality of home is rarely available as a rental and offers 456 feet of private coastline with a beautiful lawn. The first floor features an open concept kitchen/ family room, with a dining room that seats 12. Granite steps lead to a wraparound bluestone patio with a built-in bbq grill with lobster cooker, and gas firepit for entertaining, while overlooking the Atlantic. The formal living room, with gas fireplace, opens onto a covered, wraparound deck. The second floor offers 3 bedrooms and an office: Master suite with king sized bed and private deck. Guest bedroom with queen sized bed. Office with sofa bed. Guest suite over garage, with cathedral ceiling and cupola, also has king sized bed, with private deck. Lower level of house features a walk out basement suite with kitchenette, living room with 65” tv, and bedroom with queen sized bed. 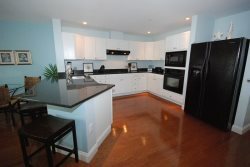 Gourmet kitchen includes: Custom cabinetry with extra large granite island with seating. Built-in 48” refrigerator and a beverage chiller. 6 burner gas range with griddle and an electric wall oven. 2 dishwashers for easy clean ups. Luxury baths: Upper floor baths feature double granite vanities and glassed in rainshowers. Heated towel warmers and floors. Lower level bathroom has a shower/tub combo. Just 10-15 minutes to downtown Portland’s delicious restaurant scene, rated by NYT (2017) as a top ten foodie destination in the U.S., and an eclectic mix of shopping in the Old Port. Close to many State Parks and beaches up and down the coast, including Portland Headlight and Two Lights.